Making its world debut at the Frankfurt auto show debut in September 1977, the 99 Turbo instantly became one of the most emblematic cars in Saab’s entire history. The launch car, finished in a unique Pearl White, is part of the Saab AB factory collection in Trollhattan, Sweden. The four-cylinder 2.0L Turbo engine offered 135 hp, compared to 115 for the standard engine. However, torque was increased dramatically. 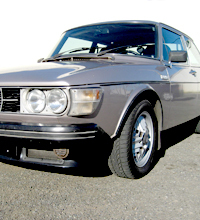 Saab was first to offer a turbo tuned for low speed torque in a sedan for daily driving, as opposed to high speed power in a pure sports car such as the Porsche 911. Saab also avoided problems previously encountered in turbocharging carbureted engines, by providing electronically controlled port fuel injection on the 99 Turbo. Emission control was via one of the first “closed loop” catalyst systems controlled by an oxygen sensor. A total of 10,607 Saabs 99 Turbo were produced, starting with 100 test fleet cars in 1977 and continuing through 1982. It was offered in 2-door, 3-door, and (very few) 5-door body styles in Europe and a four-speed manual transmission was standard. Despite mostly understated exterior colors, each 99 Turbo was immediately recognizable by the specific “Inca” alloy wheels, front air dam, rear spoiler, interior upholstery, instrumentation and steering wheel. The 99 Turbo three-door hatchback was offered in the United States only during the 1978 model year, available in Black, Cardinal Red, Grey, and Silver. After an imported total of 4,233 cars, the 99 Turbo was replaced by the larger Saab 900 Turbo three and five-door hatchback as of 1979.